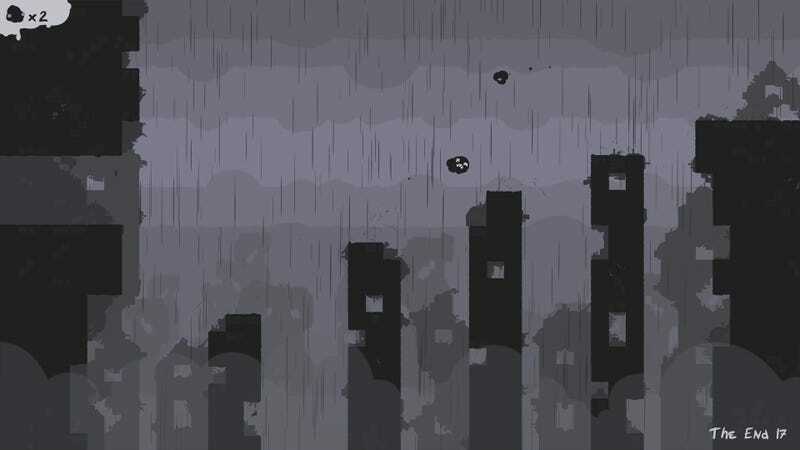 Between that and the odd row of insta-death spikes, there are some superficial similarities to Super Meat Boy. End Is Nigh, however, is a much more expansive game that seems to have more of an exploration component to it. Despite a relatively quick turnaround time (McMillen says the game was born of a two-week game jam in September of last year), it’s “by far, the largest game (level wise)” he’s ever worked on. There will be more than 600 levels spread out across 12 chapters, which will chronicle your tiny blob man’s search for a friend at the end of the world. He’ll make this friend “out of pieces of people he finds along his journey,” because hi, this is Edmund McMillen we’re talking about, remember?